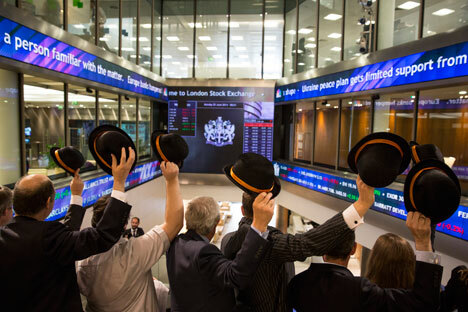 Two Russian construction companies have decided to stop trading their shares on the London stock exchange. It follows a similar decision by Russian bank FK Otkrytie. Russian construction company Rose Group, which operates in Moscow's upmarket real estate sector, is delisting its shares from the London stock exchange. In the seven years since its initial public offering (IPO), the company’s capitalisation has dropped from $1.4 billion (£895 million) to $272.2 million (£174 million). David Wood, Rose Group financial director told Russian news agency RBK: “An LSE listing cannot bring any liquidity or additional investment to a company, although it does impose certain restrictions and quite substantial costs”. The company has been trading just nine percent of its stock on the London bourse. On Nov. 21, another Russian construction company, Gals-Development, announced its decision to delist from the London exchange, while in September, a similar decision was taken by Russian bank FK Otkrytie. According to experts, this is part of a long-term trend, as Russian issuers switch from European to Asian markets. “Given a decline in Western investors’ interest in Russian equities, some companies prefer to delist from the London stock exchange,” says chief analyst with UFS IC Alexei Kozlov. According to him, “a large number of Russian equities were not particularly liquid in the best of times, whereas in this difficult time of crisis companies have to cut costs”. Mr. Kozlov points out that delisting increases the distance between an investor and an issuer, thus reducing liquidity, which makes the shares less attractive. That means that the shareholders of a company that is delisted from the LSE will incur losses since delisting will have a negative effect on the company’s valuation, he adds. “The main reasons behind a delisting decision are primarily external factors. At the moment share prices are under considerable pressure because of the depreciation of the rouble,” says Maxim Klyagin, an analyst with Finam Management. Secondly, country risks remain rather high and have a negative impact on liquidity, restricting growth prospects. “In this situation, the costs of having a listing on foreign exchanges, including high service costs, more rigorous disclosure and corporate governance requirements, may seriously outweigh potential advantages,” he adds. According to Mr. Klyagin, instead of IPOs on Western trading platforms, Russian companies will opt for the Moscow stock exchange and, quite possibly, as part of Russia’s declared “switch to Asia”, on trading platforms in the Asia-Pacific region. “Some issuers are moving to Asian platforms, while others are putting off their IPOs until better times. The decision depends on the goals and tasks a company faces,” says Mr. Kozlov at UFS IC. Andrei Kostin chairman of Russian bank VTB recently said it was considering delisting its shares from the London stock exchange. At the same time he announced that VTB intends to list on the Shanghai exchange. “The Asian region has turned into a huge capital market, which is of huge interest for Russian business when the dialogue with the West is being conducted in the language of sanctions. It is also worth noting that Russia and Russian business are enjoying a better understanding in Asia,” Mr. Kozlov adds. Speaking at the APEC summit Nov. 10, Russian Economic Development Minister Alexei Ulyukayev announced that Russian oil and gas giants Gazprom, Rosneft and Lukoil are planning to list their shares on the Hong Kong exchange. In particular, Lukoil plans to raise $1 billion (£639 million) in a secondary public offering (SPO) in Hong Kong in 2015. In June this year Gazprom placed its global depository receipts (GDRs) on the Singapore exchange. The company plans a listing in Hong Kong in order to expand its existing investor base. The first Russian company to place its shares in Hong Kong was the aluminium giant Rusal. During the placement in 2010, the company sold 10.6 percent of its shares raising $2.24 billion (£1.4 billion).